Before Buffalo’s name was revealed on the NCAA Tournament brackets, a Buffalonian received a shoutout during the Selection Sunday broadcast. “Jordan Nwora led the Cardinals in scoring and rebounding, he’ll be on display,” CBS host Greg Gumble said after announcing Louisville’s No. 7 seed in the East Region. Nwora, a two-time All-Western New York performer for the Park School, has averaged 17.3 points and 7.7 rebounds in his sophomore season at Louisville. He was recognized as Most Improved Player in the Atlantic Coast Conference and a third-team All-ACC selection. 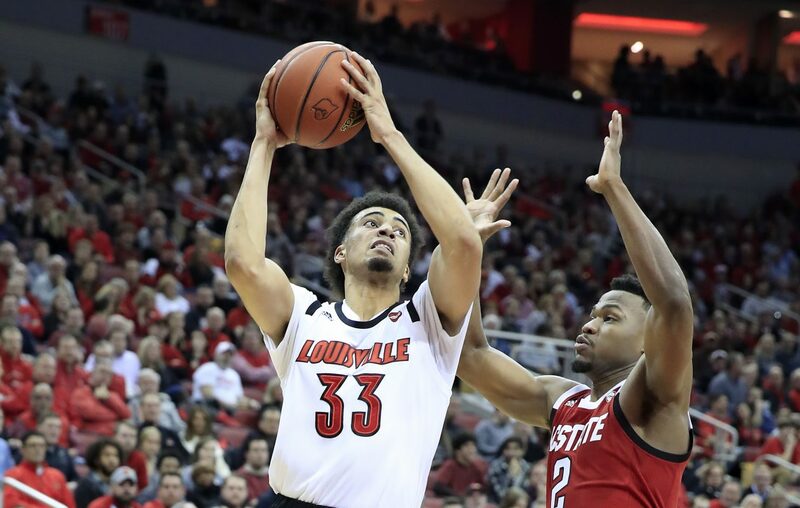 After coming off the bench and playing in the NIT during his freshman season, the sharpshooting, 6-foot-7-inch Nwora entered the starting lineup six games into this season and led Louisville (22-14) into position for a return bid to the NCAA Tournament. The Cardinals will face No. 10 seed Minnesota (21-13) at 12:15 p.m. Thursday in Des Moines, Iowa. CBS is broadcasting the game. Nwora’s father, Alex, will be about 175 miles away this week, coaching the Erie Community College men’s basketball team in the NJCAA Division II championship. The No. 4 seed Kats opened the tournament with an 83-56 victory over Morton (Ill.) and will play again on Thursday in the winner’s bracket. Here are some more local angles to keep in mind when filling out your bracket. — Howard Washington, a standout guard for City Honors and Canisius before he finished his prep career at Montverde Academy in Florida and Athlete Institute in Canada, is on the scholarship roster at Syracuse, the No. 8 seed in the West Region. Washington has applied for a medical redshirt this season, telling Syracuse.com last month that he suffered a stroke in September. Washington’s freshman season ended last January due to a torn ACL. Pete Moore, director of athletic communications for Syracuse, is an East Aurora native. The Orange have played in the NCAA Tournament 16 times since he joined the athletic department in 1998. Syracuse faces No. 9 seed Baylor at approximately 10 p.m. Thursday in Salt Lake City, Utah. The game will air on truTV. — Colby Moultrie, a Canisius graduate from North Tonawanda, and Fredonia’s Patrick Moore are walk-on players for UB. — In the women’s NCAA tournament, Cardinal O’Hara graduate Summer Hemphill will make her second straight appearance with UB. Hemphill has averaged 14.3 points on 58.3 percent shooting and 10.6 rebounds in 24 games during her junior season. She set a MAC Tournament record with 21 rebounds during the title-game victory over Ohio. UB (23-9) received the No. 10 seed in the Albany Region and will play seventh-seeded Rutgers (22-9) at 4:30 p.m. Friday (ESPN2) in Storrs, Conn. In that same bracket pod, Tess Borgosz (Depew) is a member of a Towson team making its first NCAA Tournament appearance after winning the Colonial Athletic Association title. The 6-foot-4-inch forward has appeared in 18 games, totaling 11 points and 24 rebounds in 63 minutes for the 15th-seeded Tigers (20-12), who will play No. 2 seed UConn (31-2) in the first round. — Stanford women's coach Tara VanDerveer, a former Niagara Falls resident who attended Buffalo Seminary, will coach in her 34th NCAA Tournament. The Naismith Memorial Hall of Fame member's first three trips came when she coached Ohio State from 1980-85. At Stanford, VanDerveer has reached 12 Final Fours and won two national championships. Stanford (28-4) will host No. 15 seed UC Davis (25-6) at 3:30 p.m. Saturday on ESPN2. — Hamburg native Charlie Buscaglia leads Robert Morris to the women's NCAA Tournament for the third time in his three seasons as head coach. He went to the tournament four times as the Colonials' associate head coach to his father, Sal Buscaglia, the former UB and Hilbert coach, and as an assistant at Manhattan in 2003. As the No. 16 seed in the Albany Region, Robert Morris (22-10) plays at top-seeded Louisville (29-3) at noon Friday on ESPN2. — There will be a number of Western New Yorkers on the sidelines for the men’s NCAA tournament, the most prominent being Michigan head coach John Beilein. The Niagara County native is making his 13th trip to the NCAA Tournament as the No. 2 seed in the West Region. Beilein coached Canisius to the tournament in 1996, Richmond in 1998 and West Virginia in 2005 and 2006. He ended Michigan’s 11-season tourney drought in 2009, has brought the Wolverines back to the dance in seven of the past eight seasons, and reached the national championship game in 2013 and again last season. Michigan (28-6) will face No. 15 seed Montana (26-8) at 9:20 p.m. Friday (TNT) in Des Moines, and could match up against UB if both teams advance to the Sweet 16. — Buffalo natives Rob Lanier and Desmond Oliver are assistant coaches for Tennessee, the No. 2 seed in the South bracket. Lanier, the Vols’ associate head coach, will work on the bench in the NCAA Tournament for the 11th time. He made his first two trips as an assistant at Texas before becoming the head coach at Siena and winning a Metro Atlantic Athletic Conference title in 2002. Lanier has returned to the tournament as part of the coaching staffs at Virginia, Florida, Texas and Tennessee. A former player at St. Bonaventure, Lanier’s coaching career got started with a graduate assistant and restricted earnings’ positions at Niagara from 1990-92 and included a stint at his alma mater from 1992-97. Making his second straight NCAA appearance with Tennessee, Oliver also coached in the tournament as a Georgia assistant in 2008. His coaching career started with an assistant job at Niagara (1994-97) and included tenures at St. Bonaventure (2000-01) and Canisius (2009-10). Tennessee (29-5) will play No. 15 seed Colgate (24-10) at 2:45 p.m. Friday (CBS) in Columbus, Ohio. — Grand Island graduate Carlin Hartman is going back to the tournament for a third straight year as an assistant coach at Oklahoma, the No. 9 seed in the South Region. Hartman played in consecutive NCAA tournaments for Tulane in 1992-93 and was an assistant coach at Louisiana-Lafayette when the Ragin’ Cajuns qualified in 2005. Oklahoma (19-13) will take on No. 8 seed Mississippi (20-12) at 12:40 p.m. Friday (truTV) in Columbia, S.C.
— Patrick Stasiak (Williamsville South) is in his first year as director of basketball operations for Colgate, which is making its first NCAA Tournament appearance since 1996 as champions of the Patriot League. — UB’s lead recruiter Bryan Hodgson graduated from Jamestown and started his coaching career at Jamestown Community College. He's been on the Bulls' staff for three NCAA trips in four years. — Mike Mennenga, a former assistant coach for UB (2001-05), Nichols School (2007-09) and Canisius (2012-14), is the lead recruiter for No. 12 seed Oregon. The Ducks have made the tournament in four of his five seasons on staff, advancing to the Final Four in 2016. — Kyle Neptune, a former Niagara assistant (2010-13), is a member of the coaching staff for defending national champion Villanova, a No. 6 seed this year. Shane Nichols, who coached with Neptune on Joe Mihalich’s Niagara staff for the 2012-13 season, is an assistant coach for No. 12 seed Murray State. — Ben Wood, a special assistant to the head coach for No. 11 seed Arizona State, was on Bobby Hurley’s staff at UB. — Each of UB’s previous three athletic directors now lead programs that made the NCAA Tournament: Warde Manuel (Michigan), Danny White (No. 9 seed Central Florida) and Allen Greene (No. 5 seed Auburn). Ed McLaughlin, the Niagara AD from from 2006-12, holds the same position for No. 8 seed VCU.